As we make our way into finals week, some of you may be getting more intimate with Falvey’s lounge in Holy Grounds, Falvey Hall’s reading room or the new Student Lounge for graduate students in the liberal arts and sciences, all of which are open 24/7. As you plug in, charge up, and tune in to finals mode, you should know that, if the worst should happen – if you forget to checkout a book – resources from the library are available to you even when our doors are closed. Past Masters is a massive digital collection of published and unpublished works, articles, essays, letters, reviews and more from some of the world’s greatest thinkers. In addition to classical, medieval, continental, British and American philosophy, you can find electronic editions of works in religious studies, political thought, sociology, the history of science, economics and the classics. Past Masters also offers The English Letters Collection, which consists of letters, notebooks diaries and memoirs of everyone from Austen to Yeats, and The Women Writers Collection: primary works, letters, journals and notebooks of de Beauvoir, Bronte, Shelley, Wollstonecraft and other famous women writers. You can find Past Masters on our Database A-Z list, or through the philosophy, theology/religious studies, English, classical studies, and Augustine and Culture seminar subject guides. Need to locate a passage from Augustine’s Confessions? Or trace the use of a single word throughout Aristotle’s entire works? Past Masters allows full-text searching by term, author, title and subject. Texts are available to you in in Latin, French, German, Danish, English and in authoritative English translation. Many works in the collection even feature hyperlinked endnotes and pop-up annotations, so you don’t have to flip back and forth through any dense books in print. You can even get a citation in plain text, or export it to your RefWorks or EndNote account. Encountering a problem with Past Masters? Have a question or comment? Feel free to contact the Library by phone at (610) 519-4270 or by text at (610) 816-6222, or email me personally at alexander.williams@villanova.edu. From left to right and top to bottom: W.B. 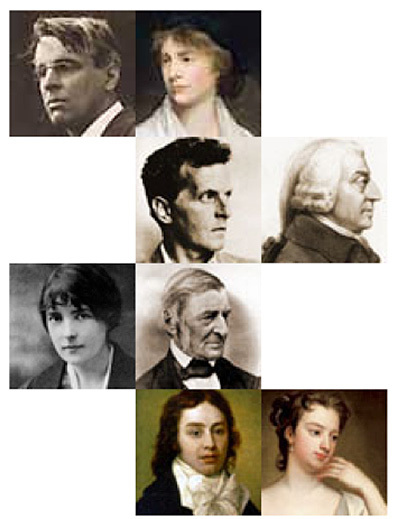 Yeats, Mary Wollstonecraft, Ludwig Wittgenstein, Adam Smith, Katherine Mansfield, Ralph Waldo Emerson, Samuel Taylor Coleridge, and Lady Mary Wortley Montagu.